Peforms outstandingly whether sown early or late and does well over a long season. 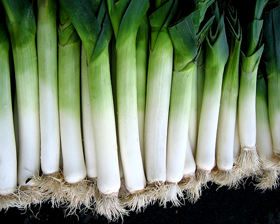 Leek Autumn Giant matures in October, yet stands ready for harvest right through to May, giving high quality, 6-7cm thick, long and very heavy up to 350g stems, of excellent mild flavour and yield with few bolters. Leeks prefer ordinary well drained soil in sun or semi shade and can follow early peas or potatoes. Sow seeds in early spring outdoors in a well prepared seed bed. Sow seeds thinly 1cm deep in drills 23cm apart.